Annie's life at the PAWS ARK 2000 sanctuary was far closer to what elephants naturally need. She had a sprawling habitat in which to roam, elephant companions, soft grass to lie down and nap on, and a lake in which she loved to bob, splash and swim. It was always a joy to see Annie enjoying her habitat. It is with very heavy hearts that we at PAWS share news of the passing of our dear friend, Asian elephant Annie - best known for her joyous romps in the lake that is part of our Asian elephant habitat at the ARK 2000 sanctuary. She had endured severe arthritis and foot disease, which gradually worsened over many years. After it became clear that the medications and treatments used to treat her chronic conditions were no longer providing relief, she was humanely euthanized on Tuesday, while lying on soft soil and surrounded by those who cared for and loved her. At age 55, she was among the oldest Asian elephants in North America. "Everyone at PAWS will miss Annie. 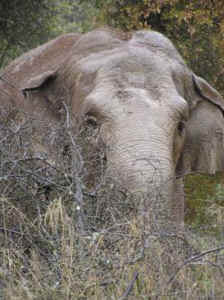 She was a very special elephant," said PAWS president Ed Stewart. "I'm proud we were able to give her a peaceful and more natural life at the PAWS sanctuary for nearly 20 years. We restored her dignity and gave her the care and respect she deserved." In 1994, the nation was shocked by videos showing Annie and her companion Tammy being cruelly trained. While held by ropes and chains handlers "broke" the elephants, mercilessly beating them into submission. This was no undercover video; the zoo recorded the training session as instruction for other keepers. (This footage was included in the 2013 HBO documentary, "An Apology to Elephants," narrated by actress and comedienne - and friend of PAWS - Lily Tomlin.) Under public pressure, the zoo opted to relocate the elephants to PAWS. Watch video: 1989 - Zoo training tape of Annie. Warning: Contains graphic images that are hard to watch. Annie arrived at PAWS in 1995, rescued from the Wisconsin zoo with Tammy, who passed away in 2003 at age 52 from chronic foot disease and arthritis - the leading causes of death for elephants in captivity. Despite their great intelligence and size, in captivity elephants are forced to live in small, barren enclosures that cause a multitude of physical and psychological harms. Their social, physical and psychological complexities may make them one of the most deprived of all captive wild animals. Annie's life at the PAWS ARK 2000 sanctuary was far closer to what elephants naturally need. 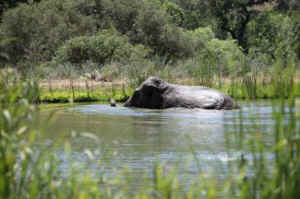 She had a sprawling habitat in which to roam, elephant companions, soft grass to lie down and nap on, and a lake in which she loved to bob, splash and swim. It was always a joy to see Annie enjoying her habitat - something we often shared with you on our Facebook page and on Youtube. Over the years, Annie experienced a variety of health problems, including an injury caused by a bull elephant during forced mating. Her arthritis and foot problems had progressed, including a severe foot abscess. In 2012, Annie tested positive for tuberculosis, but never exhibited symptoms of the disease. Her general condition remained good, including normal appetite and weight, but Annie's arthritis and foot disease ultimately made movement unbearably painful for her. Tuberculosis has been diagnosed in many elephants used for circuses and to give rides, and in zoos such as the Oregon Zoo and St. Louis Zoo. "Our job at PAWS is to restore dignity to captive elephants and, for elephants like Annie and Tammy, give them a life free from beatings and chains," explained Ed. "We did our best for them, and continue to make a significant difference in the lives of all the elephants and other wild animals under our care." As is customary for all elephants that pass away at PAWS, a necropsy is being performed on Annie's remains by pathologists from U.C. Davis Veterinary Medical Teaching Hospital and tissue samples sent to a laboratory. PAWS thanks everyone who has ever cared about and supported Annie and helped give her - and all of the wild animals at PAWS - a life of dignity, serenity, and love. On behalf of Annie and everyone at PAWS, we thank you from the bottom of our hearts.